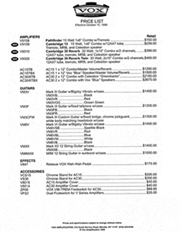 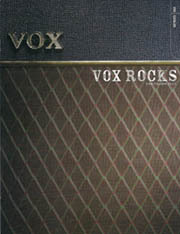 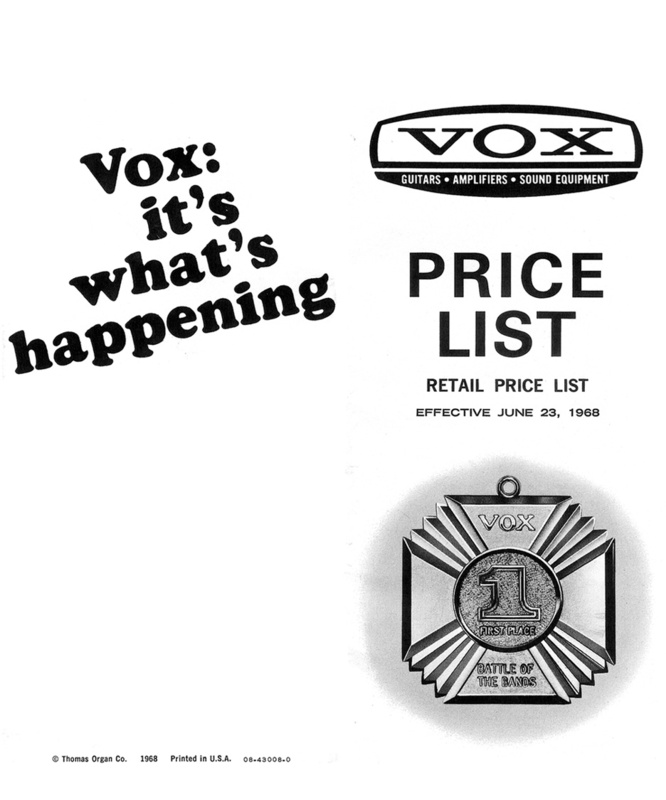 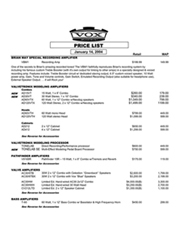 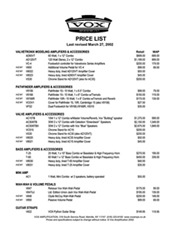 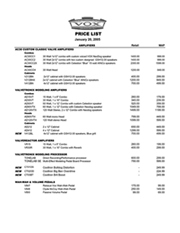 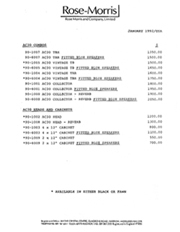 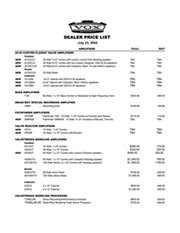 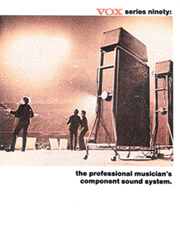 The Vox Showroom is happy to provide this historical archive of Vox product catalogs for you to learn more about current and vintage VOX products. 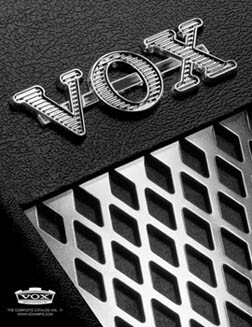 All the material on this webpage is copyrighted and the intellectual property of either Vox or North Coast Music and is provided for personal and non commercial use only. 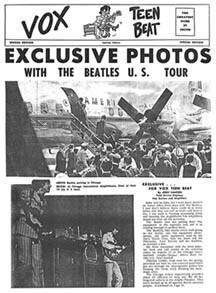 Posting these images to other web sites/chat rooms or reprinting this material for sale is illegal and is prosecutable by the respective copyright holders. 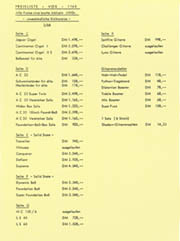 However, you may feel free to link to this page. 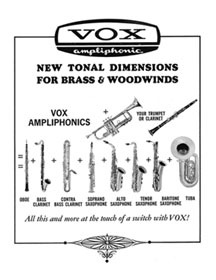 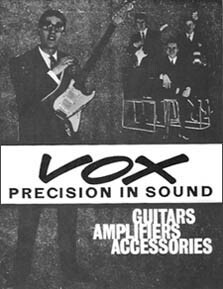 Jennings Home Organs with "Harmonic Drawbars"
1962 JMI Magazine Ad for the Vox "Cliff Richard Echo-Reverberation Unit"
1964 JMI Vox "Precison in Sound" Product Flyer - "Pop People With the Top Sounds." 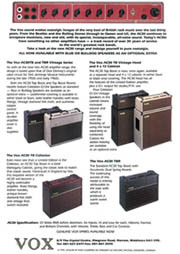 Tube AC Series amps, Hybrid UL amps, and Solid State amps - this German dealer catalog has them all! 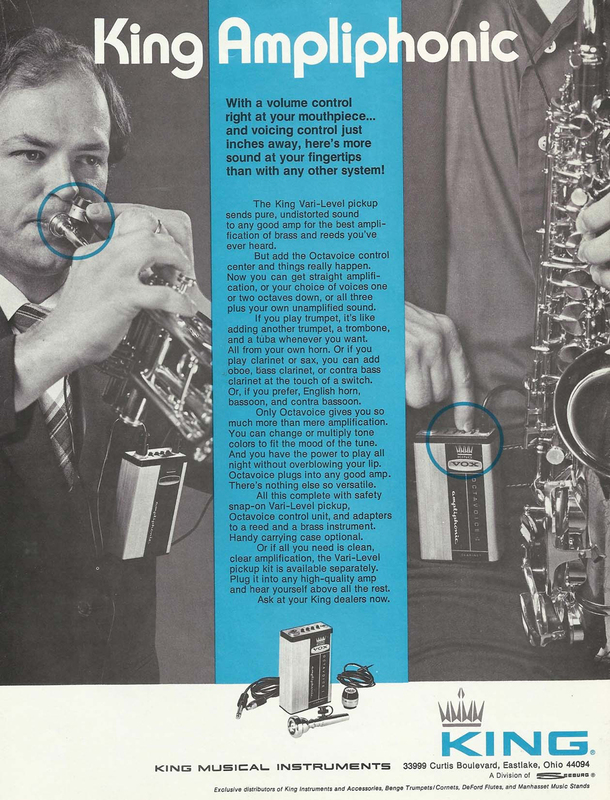 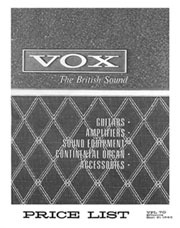 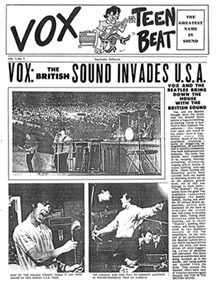 1987 Vox Product Catalog - "Britain Sounding Great!" 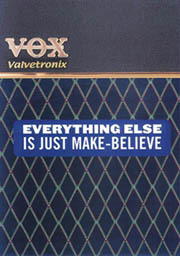 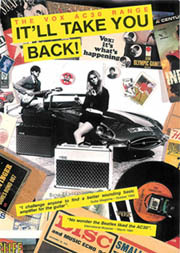 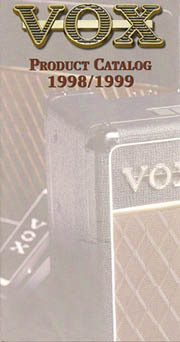 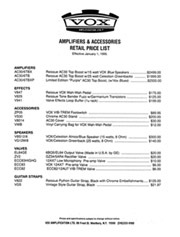 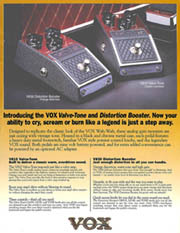 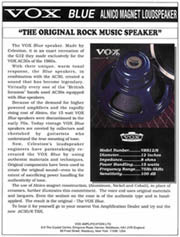 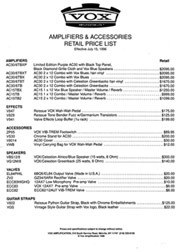 1990-91 Vox Product Flyer For the AC-30 - "It'll Take You Back"
"The Original Rock Music Speaker"
Introduces new AC-30 hand wired amps to the Vox Heritage Series and also debuts the short lived Valvetronix "Extreme" Black Chrome Series. 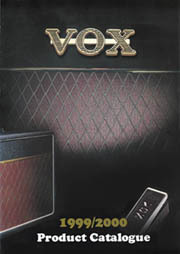 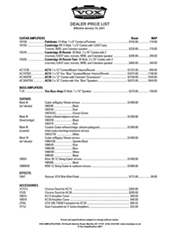 Introduces Virage Guitars, VT series amps, Jamvox, Satriano Satchurator pedals, Amplugs, AC4TV, AC4TVH, V112TV, and Night Train series amps and cabs. 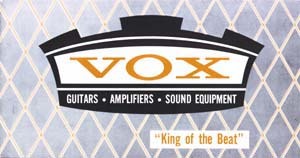 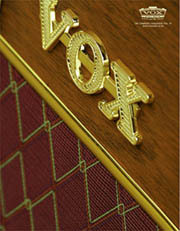 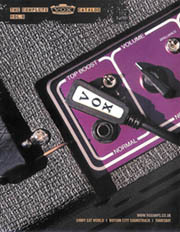 Introduces the Custom Series AC15C1, AC30C2 and AC30C2X amps along with the Vox 33/55/77 Series Guitars. 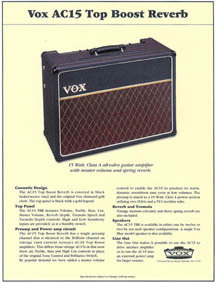 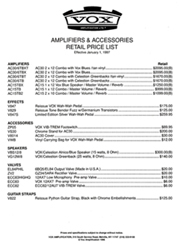 Introduces the AC15VR, AC30VR, Valvetronix VT Plus amps plus the Virage 2 and 22 Series Guitars. 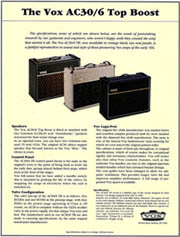 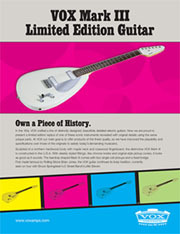 Introduces the Apache Series guitars, limited edition AC30C2 and AC15C1 amps in blue vinyl and the Jamvox III. 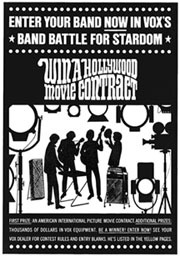 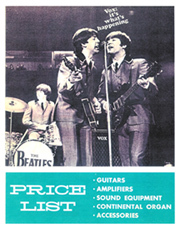 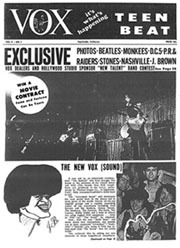 1965 Vox Advertisement From "Downbeat" Magazine featuring the Beatles - "Vox: Sound of the Longhairs"
1965 Vox Advertisement From "Downbeat" Magazine featuring the Dave Clark Five - "Vox: Sound of the Longhairs"
August 26, 1965 Vox Advertisement From "Downbeat" Magazine featuring the Rolling Stones - "Vox: Sound of the Longhairs"
"What do the Beatles have in common with the Breakaways?" 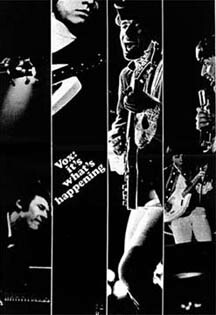 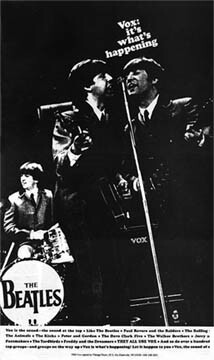 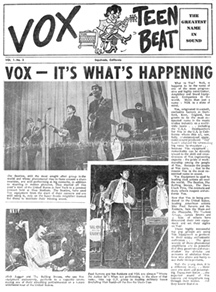 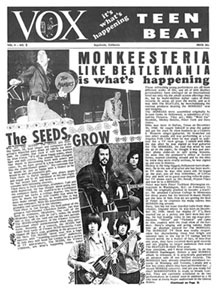 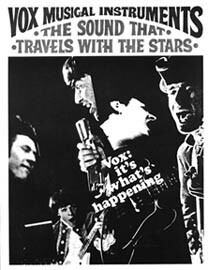 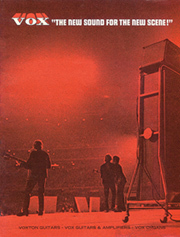 1966 Vox Advertisement From "Downbeat" Magazine featuring the Beatles - "Vox: It's What's Happening"
1966 Vox Advertisement From "Downbeat" Magazine featuring the Rolling Stones - "Vox: It's What's Happening"
1966 Vox Advertisement From "Downbeat" Magazine featuring the Fang and Drake from Paul Revere and the Raiders - "Vox: It's What's Happening"
1966 Vox Advertisement From "Downbeat" Magazine - "Paul Revere and the Raiders Ride On Top With Vox"
1969 Thomas Vox Product Catalog - "The New Sound For The New Scene!"